Product information "HI96715C Ammonia Medium Range Portable Photometer Photometer with Cal kit & Case"
The HI96715 portable photometer is for the measurement of ammonia (as NH3-N) in freshwater samples. Hanna's portable photometers feature an advanced optical system; the combination of a light emitting diode (LED), a narrow band interference filter, and silicon photodetector ensure accurate photometric readings every time. The Hanna exclusive CAL Check™ feature utilizes ready-made standards traceable to a NIST Standard for performance verification and calibration. The exclusive cuvette locking system ensures that the cuvette is inserted into the measurement cell in the same position every time to maintain a consistent path length. CAL Check™ - Allows for performance verification and calibration of the meter using a CAL Check NIST traceable secondary standard. GLP - Records the date of the last user calibration performed. Built in timer - Ensures the appropriate reaction time is used for the chemical reaction. At the end of the timer the meter will automatically take the reading. This feature ensures consistency across multiple users. Indexing indent on meter - The meter has an indent that allows for a lock and key fit with the cuvette cap. This ensures that the cuvette is indexed consistently (same position) in order to maintain the same path length for accurate results. Cooling Lamp Indicator - It is necessary to maintain a consistent temperature of the optical components in order to maintain a narrow wavelength band of light. This photometer has a cooling lamp indicator that is displayed for a short period of time before each measurement in order to allow the components to cool and obtain the highest accuracy possible. Error messages - Messages on display alerting to problems including no cap, over range and under range readings, and light source error. Auto-shut off - Automatic shut off after 10 minutes of non-use when the meter is in measurement mode. Prevents wastage of batteries in the event the meter is accidentally not turned off. • Battery icon blinks when the capacity is less than 10 %. Present naturally in surface and wastewaters, ammonia is largely present from deamination of organic nitrogen-containing compounds and hydrolysis of urea. Ammonia may also be present from water treatment processes that utilize chloramines for disinfection, where ammonia is added to the water to react with chlorine. Ammonia is less likely to appear in groundwater due to adsorption to soil particles. 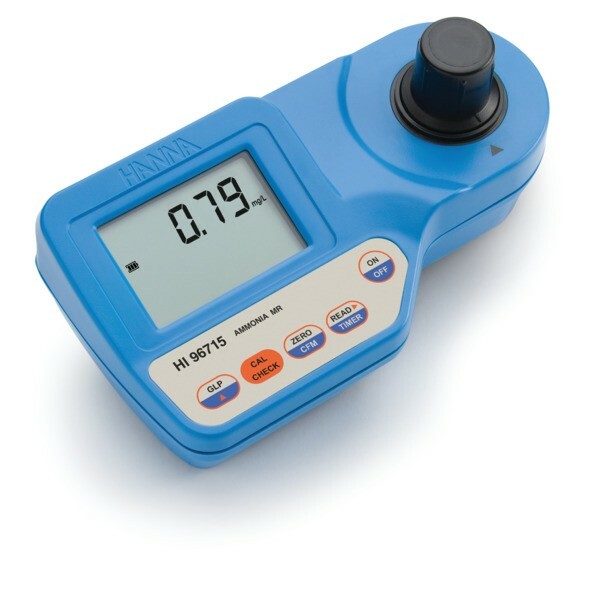 The HI96715 uses an adaptation of the ASTM Manual of Water and Environmental Technology, D1426-93 Nessler method to measure ammonia-nitrogen concentrations in the 0.00 to 9.99 mg/L (ppm) range. When the Nessler reagent is added to samples containing ammonia, the sample will turn a yellow hue; the greater the concentration, the deeper the color. The associated color change is then colorimetrically analyzed according to the Beer-Lambert Law. This principle states that light is absorbed by a complementary color, and the emitted radiation is dependent upon concentration. For mid range levels of ammonia, a narrow band interference filter at 466 nm (blue) allows only blue light to be detected by the silicon photodetector. As the change in color of the reacted sample increases, absorbance of the specific wavelength of light also increases, while transmittance decreases. The HI96715-11 CAL Check™standards are used for calibration and performance verification of photometers with the CAL Check™ function. HI96715 is supplied with sample cuvettes (2) with caps, 9V battery, instrument quality certificate and instruction manual. Related links to "HI96715C Ammonia Medium Range Portable Photometer Photometer with Cal kit & Case"
Customer evaluation for "HI96715C Ammonia Medium Range Portable Photometer Photometer with Cal kit & Case"